Moon. LG-2001-08-531-HQ. The regular daily and monthly rhythms of Earth's only natural satellite, the MOON, have guided timekeepers since ancient times. LG-2001-08-532-HQ. The red planet MARS has inspired wild flights of imagination over the ... or a rough-and-tumble mining colony of the future, Mars provides fer- tile ground for ... Recent images from NASA's Mars Global Surveyor spacecraft ..
NASA's contributions to aeronautics : aerodynamics, structures, propulsion .... vii. Foreword. 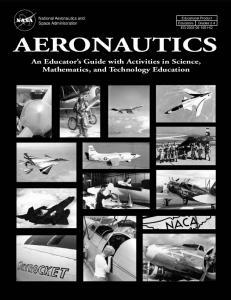 AS THIS BOOK GOES TO PRESS, the National Aeronautics and. global warming, unwanted fires and explosions, ...... experiments from operations centers worldwide. ...... NASA Educator Resource Center (ERC) network. how microgravity can help us learn about the phenomena of our ... United States, metric-sized parts such as screws and wood stock are ...... different predictions to debate each other. After the ...... in grams by measuring the pennies on a metric. About This Book iii. About the Lunar Sample Disk iv. About the Slide Set v. Activity Matrices vi. Teacher's Guide -- The Moon: Gateway to the Solar System. 1 . Scott Christa6. NASA Ames Research Center. Abstract ... The ASE onboard flight software includes several autonomy software ... Robust execution management software using the. Spacecraft ...... David E. Wilkins and Marie desJardins âA Call. Jul 25, 1994 ... SSOF. OFFEF:OR. Wyle Laboratories,Inc., 1290 Hercules, I--Iou_ton,TX 77058 ... ESTIMATED COST AND PERFORMANCE INCENTIVE FEE (PIF). B-1. B.3 .... CONTINUITY OF SI-RVICES (FAR 52.237-3) (JAN 1991). I-8. 1.9. The eighth planet from the Sun, NEPTUNE was the first planet located through mathematical predictions rather than through regular observations of the sky. When Uranus didn’t travel exactly as astronomers expected it to, two mathematicians, working independently of each other, proposed the position and mass of another, as yet unknown planet that could account for Uranus’ orbit. Although “the establishment” ignored the predictions, a young astronomer decided to look for the predicted planet. Thus, Neptune was discovered in 1846. Seventeen days later, its largest moon, Triton, was also discovered. Telescope show no sign of the “Great Dark Spot,” although a comparable spot appeared in 1997 in Neptune’s northern hemisphere. Nearly 4.5 billion kilometers from the Sun, Neptune orbits the Sun once every 165 years, and therefore it has not quite made a full circle around the Sun since it was discovered. It is invisible to the naked eye because of its extreme distance from Earth. Interestingly, due to Pluto’s unusual elliptical orbit, Neptune is actually the farthest planet from the Sun for a 20-year period out of every 248 Earth years. Neptune has eight known moons, six of which were discovered by Voyager 2. The largest, Triton, orbits Neptune in a direction opposite to the planet’s rotation direction, and is gradually getting closer until it will collide with the planet in about 10 to 100 million years, forming vast rings around Neptune that will rival or exceed Saturn’s extensive ring system. Triton is the coldest body yet visited in our solar system; temperatures on its surface are about -235 °C. Despite the deep freeze, Voyager 2 discovered great geysers of gaseous nitrogen on Triton. The planet has several rings of varying widths, confirmed by Voyager 2’s observations in 1989. The outermost ring, Adams, contains five distinct arcs (incomplete rings) named Liberté, Equalité 1, Equalité 2, Fraternité, and Courage. Next is an unnamed ring co-orbital with the moon Galatea, then Le Verrier, Lassell, Arago, and Galle. Neptune’s rings are believed to be relatively young and relatively short-lived. Mathematicians John Adams (Britain) and Jean Le Verrier (France) predict Neptune based on orbital motion of Uranus. German astronomer Johann Galle discovers Neptune using location predicted by Le Verrier. British astronomer William Lassell discovers Triton. American astronomer Gerald Kuiper discovers Nereid. Astronomers discover Neptune’s rings based on star occultations. Voyager 2 visits Neptune system. Hubble Space Telescope observes changes in Neptune’s atmosphere. About the Images (Left) Neptune’s blue color is due to methane, which absorbs red light and reflects blue light. In 1989, Voyager 2 tracked these three giant storms—the Great Dark Spot, Scooter, and Dark Spot 2. (Right, top) Voyager 2 photographed Neptunian clouds that are 50 kilometers above the underlying cloud decks. (Right, middle) Voyager 2 needed ten-minute exposures to capture images of Neptune’s main rings. (Right, bottom) Nitrogen frost coats Neptune’s largest moon Triton. Bright and dark streaks are materials deposited by winds (NASA/Voyager 2). Report "Neptune Lithograph pdf - NASA"